The section below is from my page about Great War trench watches. 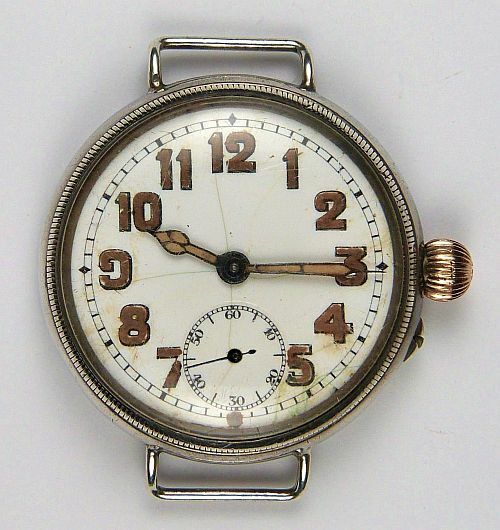 Wristwatches with wire lugs were being made before the Great War, so is there anything in particular that distinguishes what might be called a "true" trench watch? A date during the Great War is clearly a significant factor, but the singular most important distinguishing feature of a true, purpose built, trench watch is a luminous dial, which means that the hands and numerals are made luminous so that the time could be read in the dark. 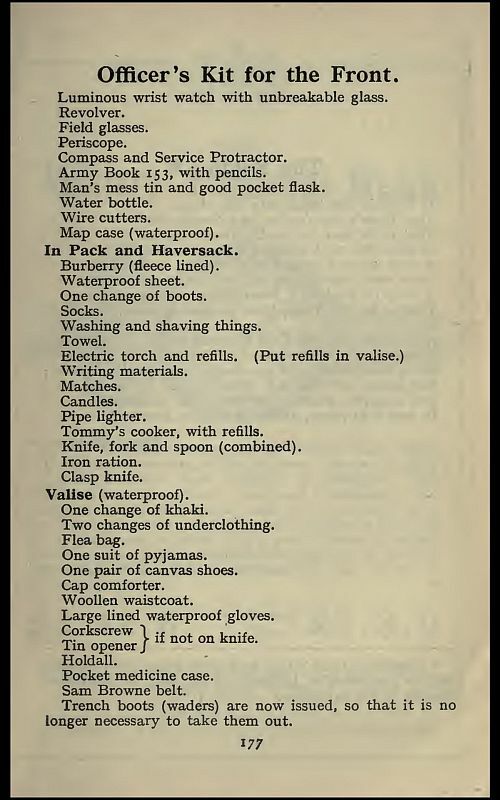 In "Knowledge for war: Every officer's handbook for the front" Captain Lake placed at the head of his list of officer's kit for the front "Luminous wristwatch with unbreakable glass". This is ahead of other indispensable items such as "Revolver" and "Field glasses". 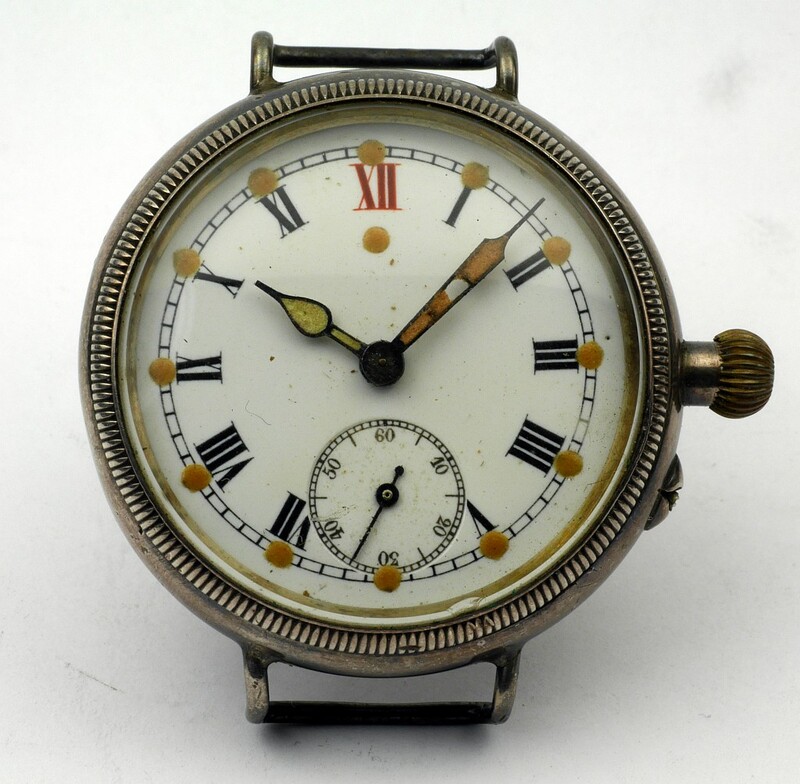 Of course wristwatches that were made without luminous dials before or during the war were pressed into service, but wristwatches that were particularly made and advertised as being intended for use in the trenches had the characteristic purpose made luminous dial. The luminous dials of trench watches have outline or ‘skeleton’ numerals and hands like those of the Borgel trench watch in the photograph here. The hands and numerals carry luminous radium paint that glowed all the time when it was new, and glowed very brightly in the dark, but the luminosity has long since worn out. The original radioactive radium luminous paint gradually lost its glow over a few years because the radiation in the paint damaged the fluorescent material so that it no longer glowed. The radiation also breaks down the varnish that was used to bind the radioactive substance and fluorescent material together into a paint, which becomes brittle and breaks up into flakes and dust, which are themselves radioactive. Even though the radium paint no longer glows because the fluorescent material is worn out, the paint is still radioactive — often surprisingly so. The radium luminous paint used during the war contained a lot more radioactive material than paint that was used in later years when the dangers of radiation were more fully understood. Luminous dials from the Great War era easily send the reading on a radiation detector off-scale. Radium has a half life of over 1,600 years so in the last 100 years it has lost hardly any of its original radioactivity. Great caution must be exercised when handling hands and dials like this because breathing in the radioactive flakes of paint or dust would be very dangerous to the lungs, see my page about luminous paint. The shape of these hands was called in Swiss/French ‘poire squelette’ (pronounced ‘skelette’) i.e. pear skeleton, after the pear shaped bulge on the hour hand. They are often referred to as "cathedral" hands because they look a bit like a leaded and stained glass window. This style is referred to in manufacturers catalogues of the time as "Luminous" or often simply "Radium". 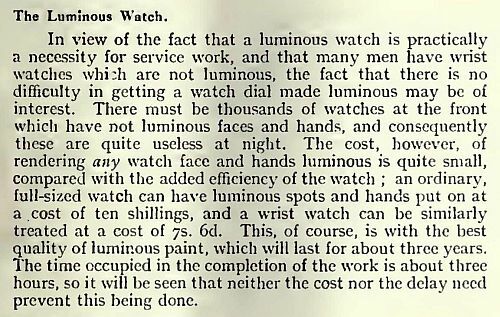 If a soldier already had a perfectly serviceable pocket watch or wristwatch that simply wasn't luminous, then this could be upgraded to a luminous watch by putting dots of radium paint on the dial next to the hour numerals, and changing the hands to the luminous radium type, as described in the article shown here from November 1915. A Borgel wrist watch that has been upgraded with replacement luminous hands and luminous spots on the dial is shown in the second photograph. The dial has a red 12, which is not a military feature but was put onto the dials of early wristwatches so that the 12 was more visually prominent. In addition to the luminous spot on the minute track above the 12 a second luminous spot has been placed below the 12 to fulfil the same function in the dark. The article states that a pocket watch could be upgraded for 10 shillings, a wristwatch for seven shillings and sixpence. British Army rates of pay as defined by War Office Instruction 166 (1914) give the pay of an infantry Lieutenant as 8 shillings and 6 pence a day, so the work cost him about a days wages. The work is said to take about three hours with no distinction made between pocket and wristwatch, the difference in price between the pocket watch and wristwatch is due to the cost of the "best quality" luminous paint. An article in the British Horological Journal in March 1915 described methods of fitting luminous hands, which the author H. Otto called “radio-hands”. He explained this rather strange term later in the article, saying that its use would stop customers later asking the watchmaker to buy back the precious radioactive substance, which they did with watch movement jewels or rolled gold. He mentions that "radium-bromit" (radium bromide) cost £20 per milligram, and that mesothorium, discovered by Otto Hahn in 1906, was about £7 per milligram. Mesothorium is an isotope of radium, radium-228, which has a half-life of 5.8 years and was cheaper than radium-226 because it was extracted from plentiful thorium ore used by the gas lighting industry to make gas mantles, so it was used in radioactive luminous paint as a cheaper substance to boost the glow. The more expensive radium bromide contained the longer lived radium-226 isotope. If you find a watch with the original radium based paint like this you will find that it no longer glows in the dark because the fluorescent material has long since worn out. You will notice that the article says that the "best quality of luminous paint" will last about three years. Radium luminous paint was made by mixing radium salts and zinc sulphide in a binder, a type of clear varnish. The radium gives off alpha particles which can't be seen, but when they hit the zinc sulphide they cause it to give off a flash of light. This gradually wears out the zinc sulphide, giving the luminous effect the three year life discussed in the article, but radium, which has a half life of about 1,600 years, will still be very nearly as radioactive as when it was new and you need to be aware of this and take some basic safety precautions - see my page about Luminous Radium Paint for more information. There was great interest in luminous dials during the Great War, as the November 1915 article says, they were regarded as "practically a necessity for service work." The powerful luminous glow in the dark from the numerals was something new and intriguing in an era before electric light was common. 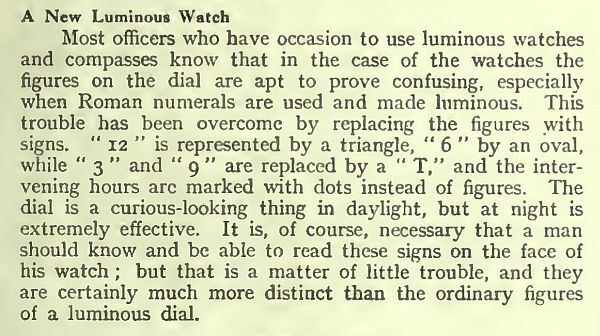 The article here from February 1915 "A New Luminous Watch" discussed replacing the normal "figure" numerals with special markers at 12, 6 and 3 and 9, the hours in between being marked with dots. It was said that this made the dial easier to read in the dark. The image here courtesy of David Weare shows one of these dials. All of the numerals apart from 12 have been replaced by symbols exactly as described in the article; at 12 there is a triangle, at six an oval, and at three and nine "T" shapes. The hours in between are marked by round dots. Much of the original luminous paint has been lost, the triangle and the round dots would originally have been filled with paint like the oval and T shapes. It is usual for the original radioactive radium luminous paint to fall off over a few years because the radiation in the paint destroys the fluorescent material so that it no longer glows. It also breaks down the varnish that was used to bind the radioactive substance and fluorescent material together into a paint, which becomes brittle and breaks up into radioactive flakes and dust. Great caution must be exercised when handling dials like this because breathing in the dust would be very dangerous to the lungs. 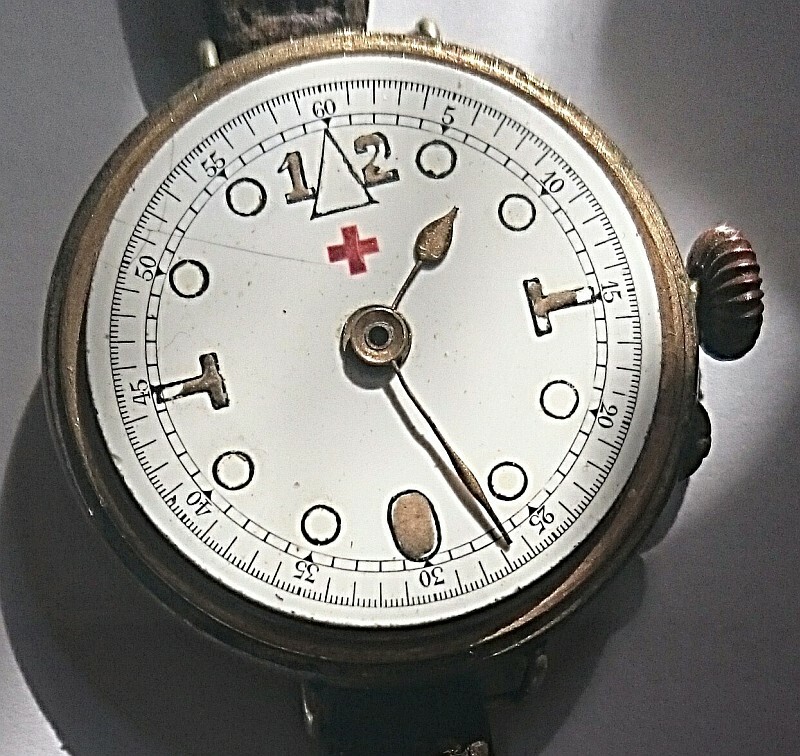 The red cross suggests that this watch was used by a medical person, which suggestion is further reinforced by the fact that it once had a sweep centre seconds hand. The hole in the centre boss of the minute hand is where the arbor for the seconds hand should protrude, and the very outer track of the dial has divisions at each fifth of a second. An 18,000 vph train, which was the frequency used almost exclusively of any other at the time, beats at fifths of a second, so in theory the time could be read in daylight to one fifth of a second. I am not sure how much easier the symbols would be to read in the dark than a conventional dial with luminised skeleton numbers, but it certainly makes the watch look much more military and like a serious piece of kit so I am surprised that it didn't take off. The hour and minute hands currently fitted are not correct, originally all three hands, hour, minute and seconds, would have been skeletonised and carried radium luminous paint like the symbols on the dial. It is worth bearing in mind that it would be no use being able to see the symbols clearly without knowing where the hands were!